Hideaway House is a place of retreat, designed for a couple who have swapped the city for quiet. Located in Sydney’s Blue Mountains, the site is secluded and surrounded by gum trees. A nearby escarpment plummets to the Megalong Valley and the bush below. The existing house is a contemporary barn, with a pitched roof and broad windows. The home is largely self-sufficient, and possesses a unique, utilitarian beauty that suits this setting. 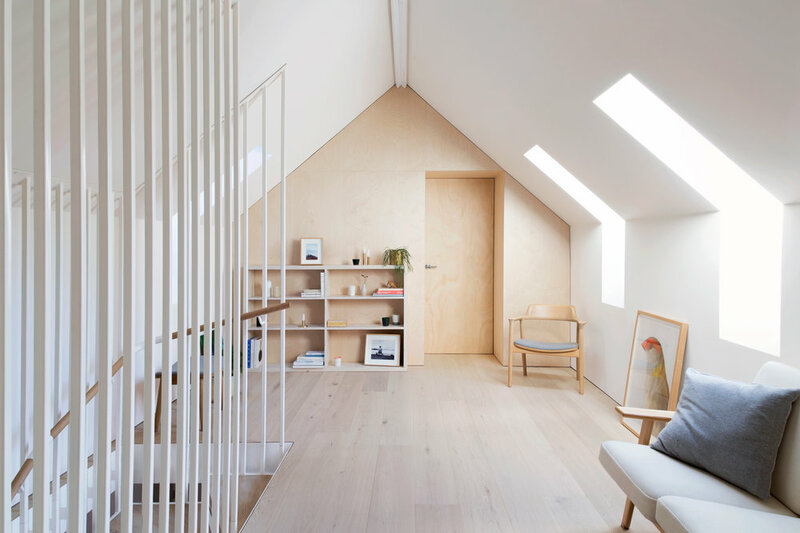 Hideaway House transforms an underused attic space into a series of bright and liveable rooms. The spatial planning is simple, with bedrooms nestled at each end of the space, and a generous hobby area between. The two storeys are linked by a finely crafted steel staircase. This stair is composed of slender steel rods and floating timber treads. The stair reads as a piece of sculpture in the space below. The first steps emerge from the floor as an inky concrete plinth, while the fine steel staircase hangs from the ceiling above. This composition contrasts black with white, and rough with smooth. The heaviness of one element reveals the delicacy of the other. In an expression of their tension, the two parts - stair and plinth - never touch. Each level of Hideaway House provides a distinctive spatial experience. While the ground floor is open and sociable, the upstairs is introverted and intimate. Moving upstairs, the house becomes cosy and calm. Along both edges, skylights scoop sunlight into the long, thin space, and disperse natural light. Their tapered frames allow for glimpses to the eucalypt forest beyond. At either end of the space, the bedrooms are tucked away behind thick plywood walls. Concealed doors pivot open, revealing rooms within the rafters. Hideaway House is inspired by the neutrality of Scandinavian and Japanese interiors. Throughout the space, the proportions, textures and tones are welcoming and familiar, inviting people to lounge and linger. This warm, minimalist aesthetic is deliberately restrained to stand the tests of trend and time. Hideaway House has been thoughtfully detailed to keep the interior as clean and uncluttered as possible. Fine shadow lines and crisp steel junctions reveal an attention to detail, construction and craft. Hideaway House was completed in collaboration with a local team, including the exacting builder, Warwick Larkin, and Ascent Engineers. Hideaway House continues our investigation into the potentials that are latent within existing structures. The project experiments with simplicity and subtlety, and reveals the space we can find within voids.